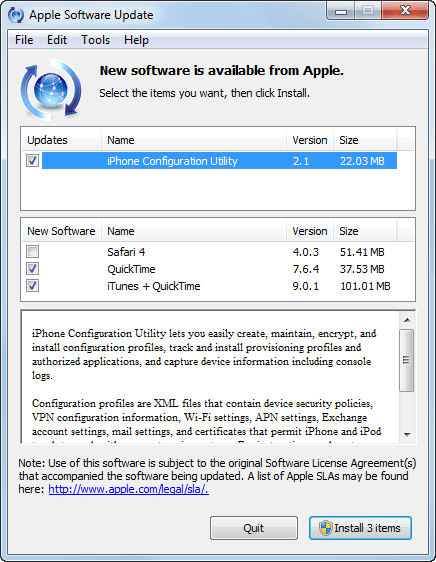 Apple first pushed an unwanted update to Windows PC’s through the Apple Software Update tool called “iPhone Configuration Utility” (see pic). The enterprise software update is pushed to all iTunes users on Windows based PC’s, even if the user does not have an iPhone, making the update unnecessary and unwanted to many iTunes users. And later on, “The iPhone configuration utility has apparently been removed from the Updates list. The contents of the New Software section are unchanged however, with QuickTime and iTunes both being selected by default when using the Apple Software Update utility,” reports.